Expedition members often pull sleds or haul bags behind them on long glacier approaches as a way to move the loads of gear and supplies (fig. 15-5). A climber can transport a normal load in a backpack in addition to pulling a sled with another pack's worth of gear. Commercial haul sleds are available, with zippered covers to hold the load, a waist harness for you to wear, and rigid aluminum poles connecting the sled to the harness. These poles help control the sled when traversing or going downhill. A cheaper but usable alternative is a plastic children's sled, with holes punched in the sides as rope attachment points. Load your gear into a duffel bag and tie it to the sled. Perlon (5 to 7 millimeters) is used to pull the sled, and most climbers prefer to attach the perlon to their pack, not their climbing harness. A final alternative is to drag a haul bag, constructed of durable, slick material to help it slide over the snow. A swivel connecter attaching the haul line to the haul bag will keep the rolling of the bag from putting twists in the line. No special trick is involved in towing a sled behind you. It simply takes steadfast pulling. Where it can get complicated is during roped travel on glaciers, where any fall into a crevasse is made more treacherous by having the sled plunge down behind you. Even if you aren't injured by the plummeting sled, rescue is more difficult with the need to deal with you, your pack (perhaps weighing 60 pounds) and the sled (carrying another 50 pounds or so). You can minimize the danger of getting hit by the sled during a crevasse fall with a simple preventive technique. Just take your climbing rope where it runs past the sled and tie it snugly with a clove hitch to a carabiner at the rear of the sled. In a crevasse fall, you will drop in, followed by the sled. But the sled will be stopped above you by the tie-in to the climbing rope. If you are using a hauling tether to the sled (instead of rigid aluminum poles), be sure the tether is long enough so you are well beyond the reach of the sled as it hangs from the climbing rope. 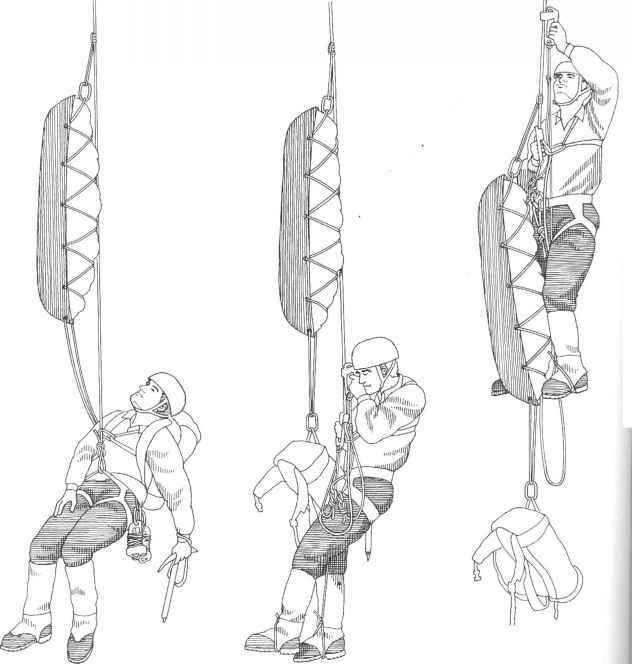 This technique depends on having a team member behind you on the rope to arrest the fall of both you and the sled, so it won't work for the last climber on a rope. The last person either assumes the extra risk, or the team can decide to haul only two sleds for each three climbers. It takes some special procedures for crevasse rescue if you are hauling a sled (fig. 15-6), beyond those methods spelled out in Chapter 13. Imagine you have just fallen into a crevasse. The sled, attached to the climbing rope, dangles above you. Here is how you can help yourself get out. First of all, get your weight onto the climbing rope. As you dangle in the crevasse, your weight may be on the sled haul line (or towing poles, if you are using a commercial sled). Transfer your weight to the climbing rope by standing in slings attached to your ascending system (mechanical ascenders, prusik slings, or a combination). Then disconnect the attachment from you to the sled. 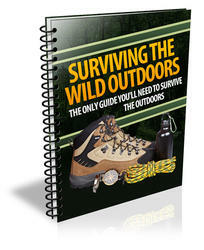 If you are using a haul line attached to your pack, simply take off the pack and let it hang from the line. Once free of the sled, you can try to rescue yourself or wait for your climbing mates to get you out. If you start up the climbing rope on your own, the sled probably will cause some complication. You may need to ascend around the climbing-rope knot that holds the sled. In this case, remove and reattach your ascenders above the knot, one at a time. You may also need to untie from the climbing rope in order to move past the sled and reach the lip of the crevasse. To make it easier to disconnect from the climbing rope, many sled-pullers travel with the rope clipped to a locking carabiner on their harness, rather than tying directly to the harness itself. If you must unclip from the climbing rope, use extreme caution to ensure that the ascenders are secure. Your fall into the crevasse can also mean extra effort for your teammates if they must pull you out. If you can't disconnect yourself from the sled or if there is no extra rescue rope available, they must haul both you and the sled at the same time. They will have to use a Z-pulley system to get the most mechanical advantage in pulling on the climbing rope. Far preferable is to use a spare rope to pull you out, and to then pull the sled out on the climbing rope it is already attached to. 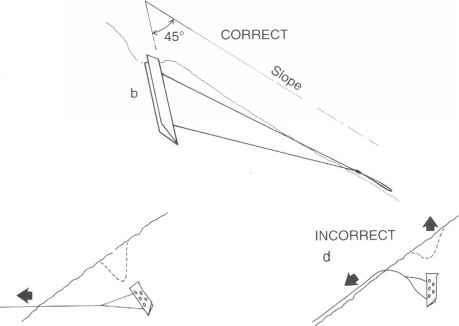 How to pull a sled mountaineering? How to use rope pulleys? Where to mount rope to pull sled?